Practicality and aesthetics now go hand in hand in kitchen design especially in the selection of kitchen sinks and faucets. Along with the main kitchen sink, today’s homes may feature a prep sink as well as a wet bar sink, making sink and faucet selection an integral part of kitchen planning. Homeowners today have a variety of finishes to choose from when it comes to faucet selection including trendy copper, classic brass, stylish nickel, traditional chrome, luxurious gold-plated. Among these options consumers can further tailor their choices with matte, shiny, brushed, and oil rubbed finishes. Faucets are simply a part of everyday being used frequently by every member of the household and as such choosing faucets that satisfy both style and function is crucial. Along with the finish, homeowners must consider both design and style. Oil rubbed finishes deliver on a more rustic feel while nickel offers a more sophisticated elegance. The shape and style of your sink, along with your countertop, cabinetry, and light fixtures also contribute to your faucet style selection. Touch faucets with coordinating touch soap dispensers are a growing trend. These must have faucets are ideal for messy hands – from cooks to kids – and also shut off on automatically should you forget. These trendy touch faucets also come in all the finishes you know and love. Keep in mind as you consider kitchen trends, they don’t go in out of style quickly like fashion clothing trends, so it is important to choose sinks and faucets you truly love, as they will be with you for years of function and enjoyment. A second sink in the kitchen is a growing trend in kitchens everywhere. An added sink provides more space for prepping beverages or rinsing glasses or washing hands, allowing your main sink to serve other needs. These second sinks can also multitask with integrated colanders, scales, cutting boards, and knife blocks. It is the perfect trend for aspiring home chefs with busy kitchens. Another popular sink trend is undermount kitchen sinks. While you’ve likely heard the term, these undermount wonders are sinks installed below your countertops making cleaning a breeze and offering up seamless style. The caveat here is undermount sinks can only be installed with solid surfaces like granite, marble, and composite countertops. Depending on your age, you may remember a time when stark white or stainless sinks with chrome hardware seemed the only option available for trendy kitchen designs. Well no more! Today’s finishes allow not only choice colors in your fixtures but in your sinks as well – with copper, black, bronze, brick, gray, blue, and more! Mixing tones with your choice of polish and shine lets you create your distinctive panache. 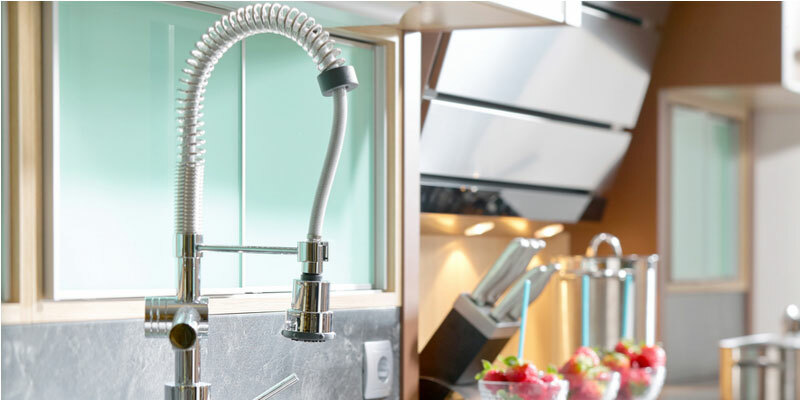 Now that you’ve had a taste of the latest in kitchen sinks and faucet happenings, which one would you like to try?